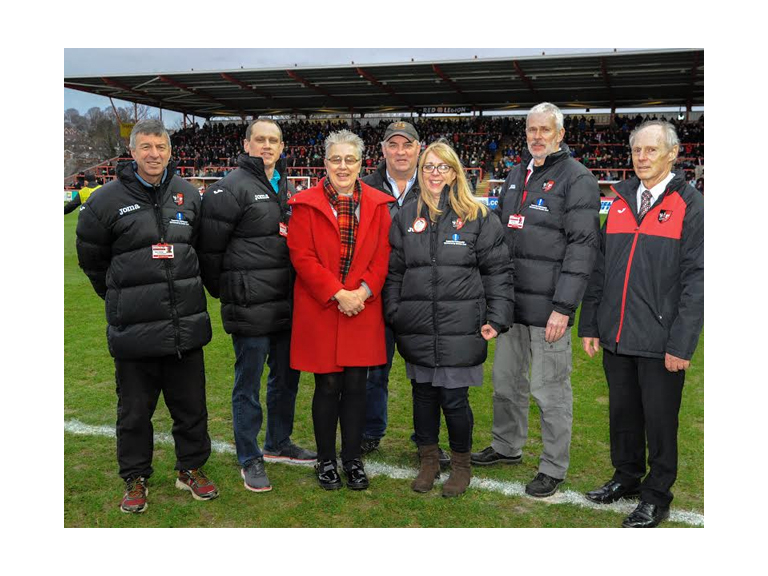 A special presentation took place on the pitch at half-time on Saturday, February 4 as the Grecians took on Crewe Alexandra at St James Park. The role of a matchday ambassador, now in its fifth year, is to welcome supporters to St James Park an hour before kick-off. The ambassadors play a key role for first-time visitors, providing direction to the area of the stadium they require, and answering questions. Ambassadors are fully briefed before each match and are informed on upcoming Exeter City events and fixtures so they can share with visitors to St James Park. Speaking about the role, matchday ambassador Phil Bater said: “I saw the role of Ambassador as a way to play a practical part in our club, and to promote our friendliness to all supporters. There is great satisfaction to be gained from meeting and chatting with visiting away fans when they arrive at our ground and engaging with regular and first time supporters and those City fans returning after an absence”. Grecian Goal, a fundraising initiative led by Elaine Davis, pledged £300 to purchase the new coats. Grecian Goal’s members have fun contributing to ECFC projects. Pledgers set their own terms and conditions, ranging from the sensible to the eccentric – some past examples of pledges include £1 per goal scored by City, £10 if a seagull lands on the pitch whilst the game is in progress. Elaine Davis, Grecian Goal coordinator said: “The ambassadors do such a great job and enhance our reputation with new and visiting supporters. I'm happy that Grecian Goal has been able to support their efforts and am proud that ‘supported by Grecian Goal’ has been embroidered on the coats” Richard Knight, Head of Customer Relations and Supporter Liaison Officer said: “Grecian Goal has done a fantastic job with the Light up the Park appeal and GPS fundraiser in recent times. This is yet another example of how important, and well spent the money raised is. The club would love to expand the role of matchday ambassador to inside the stadium. If you are interested, outgoing people who are available for 45minutes to an hour before kick-off on matchdays are required.